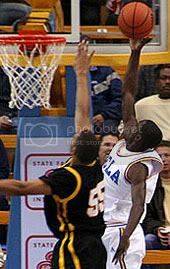 UCLA sophomores Darren Collison and Luc Richard Mbah a Moute both announced they would not test the waters of the NBA and remain in Westwood for their junior years. Both players met with UCLA Head Coach Ben Howland the week following the Final Four to discuss their futures. Howland indicated how this year's NBA draft would be one of the strongest in recent history as a result of last year's elite high school players, such as Kevin Durant and Greg Oden who were prevented from joining the draft due to an NBA rule change, entering the draft this year. early- to mid-first round pick when he does leave for the NBA." Howland says Collison will work hard over the summer to gain more weight and strength as well as develop his point-guard skills. 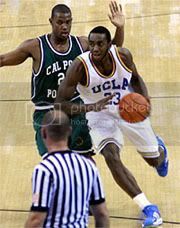 As for Mbah a Moute, the UCLA coach feels he has a good chance of spending more time at the three spot, but it will depend on how much he improves before the start of next season. putting their name in the draft and testing the waters," Howland said. BBR Notes: Josh Shipp returned to school this week on crutches and attended the team's meeting on Monday. Howland expects Shipp to be fully recovered before the start of the season. That's good! They both need to stay and improve!! 3) With Love in town, u better get your season tix!! I wouldn't mind seeing BBR's ranking of, say, our top five recruiting targets in the Class of 2008. Gracias in advance! Agree with Swoop...I was sweating as well. DC would have definitely gone in rd 1. BBR---I am very impressed with your consistently excellent journalism. It is why you are No 1 on my Bookmarks! Keep up the excellent work! Will next year's starting five be Collison, Shipp, Mbah a Moute, Love and Mata? I've been hearing that the plan is to move Shipp to the 2 and Mbah a Moute to the 3. Will Love play the 4 and Mata the 5, or vice versa? It will definitely help Love to be able to practice against Mata and Aboya, who are big, strong, mature players. Also, I think Rolle will benefit from Love's post scoring threat and passing ability. He will probably see a lot of wide open 3's on the inside out game. I agree with all of the above comments about BBR - keep up the good work! Hooray for Collison! The longer you stay in Coach Howland's program, you will only improve your defensive game. That makes your next-level potential that much more attractive. I would like the Bruins to get commits from the following players (based on the 8/5 rule): 2008 - Holiday-SG; Gordon-PF; Drew-PG (We already have commits from guards Lee and Anderson) 2009: Sidney-PF/C; D. Wear-PF; T. Wear-PF. Correct me if I am wrong but this would total the maximum 8 scholarships over a two year span. We have the talent coming in already in 2007 with Love and Stanback, then in 2008 we go small (assuming Collison heads off to the NBA), get Gordon to replace Mata inside, and in 2009 we go big (preparing for the possiblity of Love leaving after one year)! Oh and most importantly, do whatever it takes to keep the best coach in the NCAA to stay at the most respected basketball tradition in the country...U-C-L-A! The 8/5 rule has been removed, with all the early NBA deffections it didn't make sense. For example, OSU signed 5 players last year, 5 this year and has alredy gotten 5 verbals for the '08 class. Sounds good to me Swoop. Then throw in another summer of Coach Howland's defensive training, and then add Roll, Aboya, Keefe, Dragovic, and Stanback coming off the bench, I'm starting to salivate already!!! Sorry almost forgot Mata...he'll work a great rotation with Love at the center spot!